It was something that had been nagging me for quite a while; the thought of being 27-years-old and in the worst physical shape I’ve ever been. Weight kept creeping up at the pace of about a kilo per year and my 11-year-old brother can now challenge me in doing chin ups. I used to run before moving to the UK but was never really able to keep up the routine here. And routine is, I think, one of the most important things when it comes to exercise. By setting that goal, it was easy to motivate myself to go outside and run. Another even greater source of motivation has been that my friends Ville, Johanna and Heikki joined me on the challenge. Ville ‘virtually’, as he lives in Finland. It’s been so good to have company along the way. Another challenge Ville and I set ourselves about 7 years ago was to run a marathon by the time we’re 27. I don’t think we’ll quite make it (after all we are both 27 already) but to try and live up to that promise, I’m signing up for the Edinburgh Marathon that takes place in May next year. I haven’t set a target time yet, we’ll first have to see how training goes. Good shoes are the most essential thing you can invest on if thinking of taking up running. After all, on a 10 km run your feet will hit the asphalt some 11’000 times, they need something nice in between. Mine are Asics Gel’s that my dad kindly passed on. He’s been using the same make, model and size for years now but the ones he bought earlier this autumn didn’t fit properly. Apparently Asics had changed the recipe. They fit me perfectly so that’s good. First running gear item I bought after starting was shorts. Problem I had was that my thighs were rubbing against each other and causing a rash. Instead of trying out the Dr. Michael Hfuhruhurr method of walking/running without knees touching, I decided to get NikeFit shorts. They have a little pocket in the back that’s good for keys and perfect size for the iPhone. Surprisingly, can’t even feel it’s there. Talking about the iPhone, I tried out RunKeeper for some ten of the last runs. 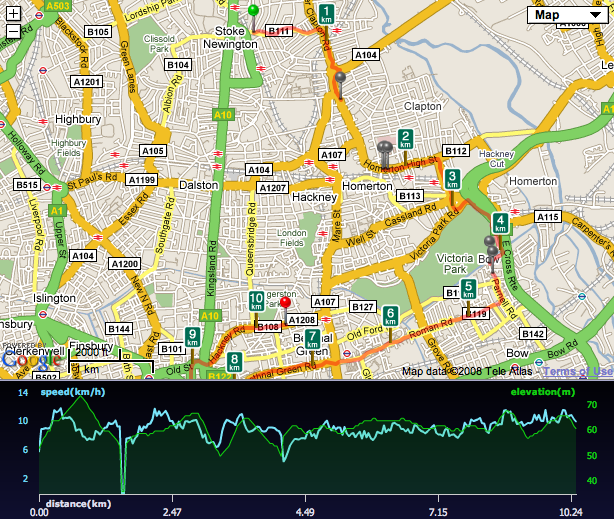 It’s a general exercise app that I was really excited with what it promises; distance, pace, speed, path on a map etc. Just what you’d expect from a well equipped running watch. It took me five or six tries before I got a solid good result from it. One thing or another always seemed to go wrong. Some of the problems are inherit to how the iPhone work i.e. you can’t have apps running in the background – which means you can’t properly lock the screen while running – and GPS drains the battery really fast. Biggest problem, however was the unreliability of the app, things like the screen showing that one minute I’m running at a steady 9 km/h and next I’m sprinting at 20 km/h (once it even said I’m running at almost 200 km/h). Also system wide warnings like low battery and incoming text messages paused the training, which meant that either you stopped to pay attention to your run and fixed your tracking or – more likely – just kept going and had a big gap in your route. Although it has a build in screen lock, I found on few occasions that it had released and paused or stopped the trip. Very annoying. All this said, I think if they can fix the problems they have, it’ll be very useful. Cool thing that it does is it sends data of your run to their website and you can view it there along with a map of the run. It does it very quickly; if I press ‘Save Trip’ downstairs after the run, it’s ready to view by the time I’m in the flat. It’s also free, so barrier of entry is very low, all you have to do is to bear with it’s short comings. Over all, good thing about running is that it’s not about equipment or skill or even time, all you need is the will to get started. This entry was posted in Fitness And Running, Personal and tagged 300km Challenge on 18/11/2008 by kristian tapaninaho. http://www.walkjogrun.net is good for routes, measuring distances and such, but beware, your run may appear longer when running than it actually is. Asics. I have used nothing else. Basically, once you have a trainer that’s good for your foot stick with it. For ever. Will to get started – as I have said many times before: running is 10% physical fitness, 90% stubbornness. All in all, well done. The important thing now is to keep going, set new targets, and enter the Sussex Beacon Half Marathon. Goals seem to be the way to go when trying to motivate yourself. Nice three month waypoint to keep interest up. I haven’t seen that site before, pretty cool! Here’s my Saturdays run. It’s quite fun to see other peoples routes. Seems like there’s few other runners in this building. Nice.